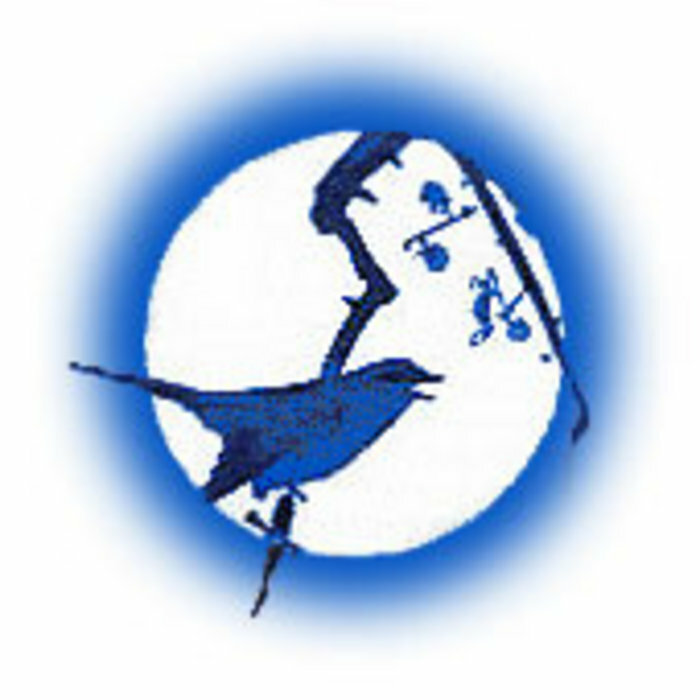 See HERE for program information on the FCCJ website. How the shadows have fallen over East Asia in the space of these past few years. Just three years ago, North and South Korean leaders met and signed an agreement to cooperate and work out a path to peaceful unification of their divided peninsula, and specifically to turn the contested West Sea area into a zone of peace and cooperation; two years ago Barack Obama came to office in the United States promising a better world, progress toward nuclear disarmament, an end to war, dialogue with all “enemies;” just over one year ago, Hatoyama Yukio became Prime Minister of Japan, promising change, the vision of an East Asian Community, equi-distant diplomacy with China and the United States, and transformation of the South China Sea into a “Sea of Fraternité” (Yuai no umi) (and Ozawa Ichiro led his famous friendship mission of 600 to Beijing, derided by Richard Armitage as the Japanese People’s Liberation Army descending on China). Now, as 2010 moves towards its end, massive military exercises (war games) take place around the Korean peninsula and in the Sea of Japan. Are they defensive? Are they provocative? Are we heading towards war? The governments that came to power in Korea in 2008 and in US and Japan in 2009 turned away from peaceful change. LMB scrapped the cooperation agreement negotiated by his predecessor; Obama continued, and intensified the two wars he inherited (while engaging in pressures and threats, rather than negotiations, that suggested the possibility of a third and even a fourth, in Iran and North Korea); and Japan moves simultaneously towards participation in collective war-rehearsing exercises that are almost certainly unconstitutional, presses for construction of a new base for the Marines in Henoko, and to reinforce the SDF military presence on the outlying islands. The downward spiral accelerated through this year,, which has been punctuated by three major events: Cheonan in March, Senkaku in September, and Yeonpyeong in November. In September, a Chinese fishing trawler collided with a Japanese Coastguard vessel in the contested waters off the Senkaku/Diaoyu Islands. The US-led global coalition (and its media), without hesitation or qualification, blamed China for belligerence. Yet, by arresting the ship’s captain the Government of Japan was unilaterally abrogating the 1978 agreement with China’s Deng Xiaoping, and by insisting there was no question of Japan’s incontestable sovereignty (when clearly there is), it was insulting both China and Taiwan. In November, a North Korean artillery barrage killed four people on South Korea’s Yeonpyeong Island and again South Korea, together with the US and Japan, blamed North Korea for “unprovoked aggression.” Yet this was the third day of huge South Korean war games (70,000 soldiers, 500 warplanes, 90 helicopters, 50 warships) conducted just a few kilometres off North Korean shores, into waters of indeterminate legal status, from an island that South Korea occupies pending a peace treaty settlement, and which it has progressively militarized in breach of the Ceasefire (2/13). Brushing aside NK protests, SK on 23 November fired 3,657 rounds of artillery into these contested waters over four hours, until eventually North Korea did what it had said it would: it retaliated. It was, said Obama, “outrageous,” and to Hillary Clinton “provocative and belligerent behaviour” that “jeopardizes peace and stability in Asia.” Japan too saw it as an outrageous, unprovoked attack. SK’s Defense Minister spoke of reintroducing US nuclear weapons into the peninsula. The nuclear-powered aircraft carrier George Washington sailed into the Yellow Sea, not only immeasurably enhancing the intimidation of North Korea but also provoking China, since its presence in these waters was as if the Chinese Navy had sailed into New York harbour or off the coast of California for war games. The US, Japan, and South Korea refused to return to the Beijing talks. Trilateral exercises (with Korean observers) in Japan’s waters followed in early December, the largest war games the US and Japan had ever conducted (with again the George Washington in pride of place). The frequency of war games steadily rises and one thing we know from history: the more you play, the more likely it is that it ceases to be play. The war that began in Korea in June 1950 continues, merely suspended. US nuclear intimidation (Operation Hudson Harbour…) during the war continued after it. It introduced nuclear weapons into South Korea in 1958, and has continued, with only a very few periods excepted, to threaten nuclear attack to this day, 60 years from first intimidating North Korea with them. In that respect, North Korea is truly unique: it has suffered US nuclear threat far longer than any country in history. The world showed no interest so long as North Korea was and is the object of the terror, but outrage when North Korea attempted to counter the threat by the only available means: getting its own deterrent. Security in Northeast Asia has rested for six decades on nuclear intimidation, with both Japan and South Korea clinging to what they see as their nuclear “umbrella,” but which North Koreans see as a terror weapon brandished against them. North Korea (especially after seeing what happened to Iraq in 2003) was reinforced in its belief that it could have no security without a deterrent. Especially over the years since the end of the Cold War, it has made many efforts to negotiate a resolution, an end to the war, peace and normalization with the US and Japan, and the lifting of sanctions. It is common in mainstream international discourse to refer to the “North Korea nuclear problem” and talks to “denuclearize North Korea,” leaving the North Korean objectives of peace and normalization to some undefined point that will follow its surrender. But that has always been an unlikely scenario. Contrary to common understanding, NK has generally stuck to its agreements, while the US (and Japan) side have oscillated wildly, reluctant to enter them and quick to scrap them. To recapitulate, in 1994 the first nuclear crisis was resolved by the Geneva Agreement of 1994, under which NK froze its plutonium programs under IAEA inspection and which saw relations in the late Clinton year warming until the exchange of high level visits took relations to the threshold of normalization. But the clock ran out, and Bush reverted to denunciation of North Korea as Axis of Evil and allegations of a secret uranium enrichment program, scraping the Geneva Agreement. Then came the Beijing process, and in 2005 and again in 2007, agreements were reached. But, just one day after the 2005 deal, the US launched allegations of North Korean counterfeiting of US dollars. Those allegations were in due course dropped, and the Beijing parties again came to agreement in 2007: in return for North Korea disabling its facilities, readmitting international inspectors, and declaring its nuclear facilities (for eventual demolition), partner countries would supply energy aid, relax sanctions, and move towards full “normalization.” Shortly afterwards, the New York Philharmonic performed in Pyongyang. North Korea did what was required of it, disabling its main nuclear facilities and presenting its list of those to be dismantled (with 18,000 pages of documentation), while for its part the US removed North Korea from the list of terror-supporting states and some energy aid was provided. Again, however, the US (and Japan) walked away from the agreement, insisting that North Korea “come clean” on uranium enrichment programs that it denied it had (and later that it confess to a Syrian engagement that it also denied). As for Japan, the North Korean attempt to normalize by Kim Jong Il’s abject apology of 2002 solved nothing and actually made things worse, since Japan came to adopt the view that North Korea must satisfy it and return to it people NK has always insisted are not alive) before it (Japan) would honor its Beijing obligations. Megumi became Japan’s No foreign policy priority. No country has been more intransigent, less cooperative in the Beijing process, more resistant to North Korea’s de-listing as a terror supporting state in 2008 (and more vociferous afterwards in calling for it to be reversed), and more influential in the drafting and promoting of hard-line resolutions for the Security Council. 100 years after Japan reduced the entire peninsula to its colony, today, glaring at the half of it that it refuses to normalize relations with, it plays a lead role in isolating and denouncing it. In other words, in 2002, 2005 and again 2007, powerful elements in Washington, Tokyo, Washington and (from 2008) Seoul combined to block negotiated agreements. Required to yield more than it had bargained for, and offered less than it had been promised, North Korea slowed, stopped, and eventually reversed its compliance. Western and Japanese politicians and opinion leaders commonly describe NK as an inexplicable, absurd, threatening, tin-pot state that must be brought to heel, and assume that “pressure” is the only way to get things done. The record, however, suggests otherwise. Rather than threatening to rampage across any or all of its borders, it is best seen as a “porcupine state.”, You could even say a paranoid porcupine, except that paranoia is unrealistic fear, while for North Korea fear is real. The shrill, bombastic tones of its media best seen as the attempt psychologically to compensate for insecurity and fear. It is indeed a very peculiar state, a 21st century patrimonial, absolutist monarchy. But the paradox of the 60-year war is that nothing so helps sustain the dictatorship as the extraordinary external pressures upon it. 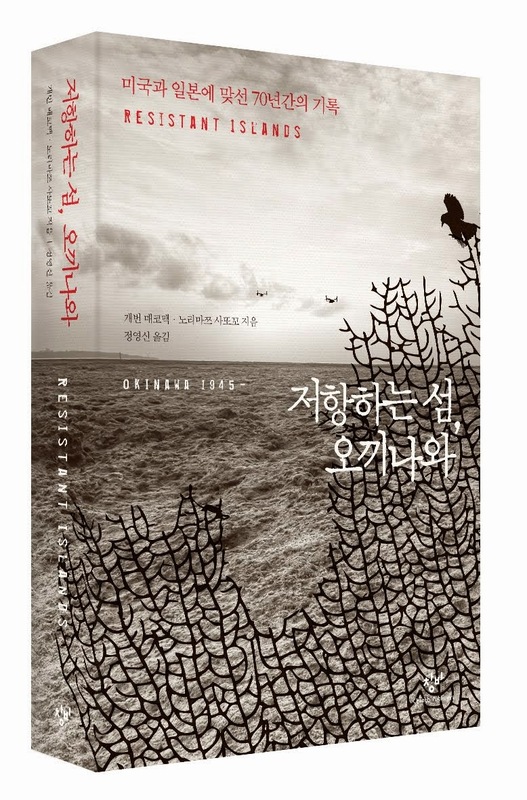 While intimidation does not compel the North Korean leadership to submit, it provides an instrument to mobilize the country in a spirit of what in Japan used be called kokutai goji (in that case around the tenno family, in this one around the Kim family) Paradoxically, the quickest way to lighten the people’s suffering and to improve their human rights would be to normalize relations with the state, since nothing so helps sustain the dictatorship as the tension of confrontation and threat. As the South Korean people dispatched their military dictatorship in 1987, in defiance of US and Japanese supports for the regime, so if allowed to do so, would the North Korean people surely deal with their dictatorship. In diplomatic terms only one weapon has proved effective with North Korea: respect. Under South Korean sunshine policies, the North Korean mists began to lift. Likewise when US governments have shown respect and concern for face, negotiations have borne fruit. The North Korea problem is not that of a violent or aggressive state but the unresolved legacy of a century of Japanese imperialism, national division and civil and international war, marked by persistent international intervention. What is needed now is not more intimidation and sanctions but some sense of history, some wisdom and humanity, and the political will to launch negotiations for a peace treaty and comprehensive normalization. KJI is commonly denounced as a madman, but those who meet and talk to him (Koizumi included) report a highly intelligent and quick-witted man, with firm grasp of the state of the world. So the strangeness of North Korea’s state formation is matched only by the strangeness of the US and Japanese refusal to negotiate in good faith, and their insistence on turning this poor, paranoid kingdom into a Hitlerite threat to the peace of East Asia, perhaps the most hated and despised country in modern history. One can even wonder does the US require North Korea, as a threatening “other,” a bogeyman that justifies the maintenance of the web of alliances on which US hegemony rests. What is clear as of late 2010, however, is that to leave things as they are, or simply to reinforce the alliances, the war games, and the hostility, is a recipe for disaster. Satoko's new article been published on Asia-Pacific Journal: Japan Focus. bomb, situated at the corner of Nagasaki Atomic Bomb Park. ... Read the rest of the article HERE. ... See all of Satoko's articles on Asia-Pacific Journal: Japan Focus HERE. 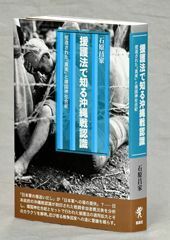 ... Satoko and her colleagues on the Hiroshima/Nagasaki peace study tour co-produced “Hiroshima, Nagasaki e no genbaku toka saiko – nichibei no shiten 『広島長崎への原爆投下再考―日米の視点』(Rethinking the atomic-bombing of Hiroshima and Nagasaki – Japan and U.S. perspectives),” co-authored by Kimura Akira and Peter Kuznick, translated by Norimatsu Satoko, columns contributed by Fujioka Atsushi and Norimatsu Satoko (2010, Horitsu Bunkasha　２０１０年　法律文化社). 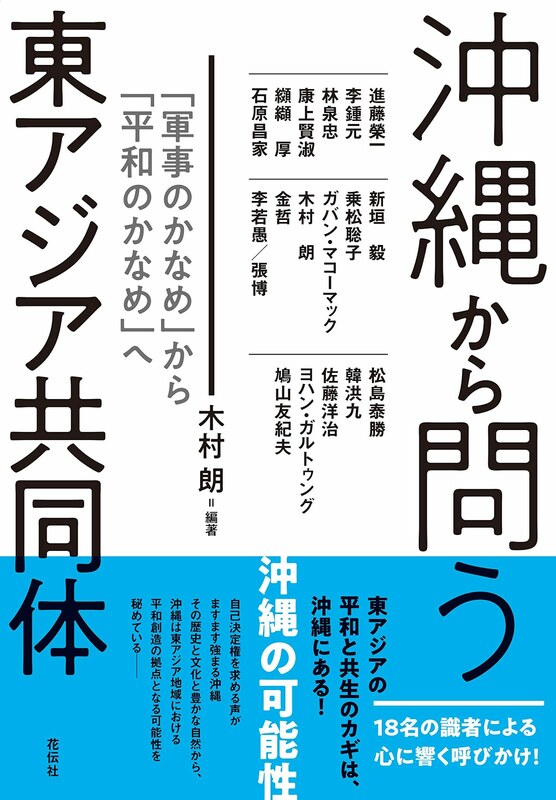 See HERE for more information about the book and a review from Chugoku Shimbun. 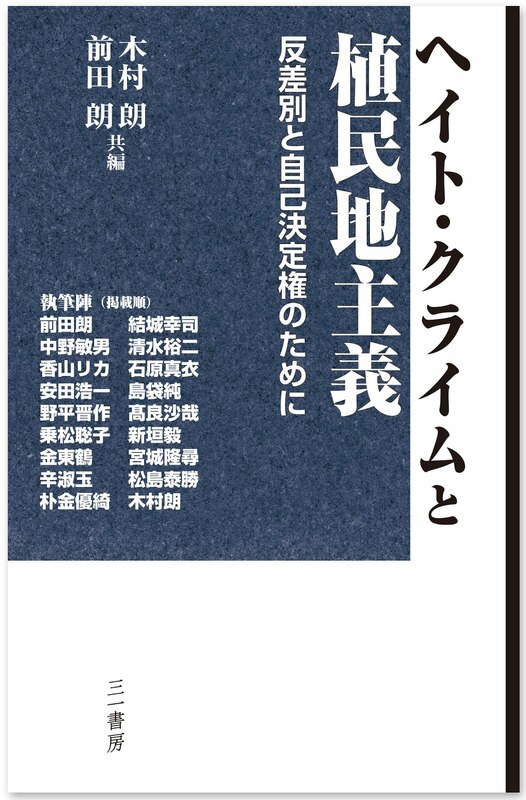 “Rethinking the Atomic Bombings of Hiroshima and Nagasaki: Japanese and U.S. Perspectives,” comprised of studies by an American and a Japanese scholar, has been published. 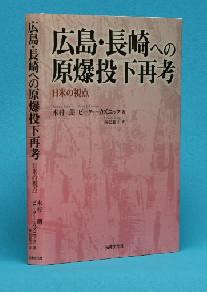 The book thoroughly refutes the official view of the atomic bombings by the U.S. government in claiming that the bombings saved the lives of many U.S. and Japanese soldiers, as well as Japanese civilians, and hastened the end of World War II. The scholars argue that this view is, in fact, an “A-bomb myth,” and that the perpetuation of this myth up to today contributes to enabling the “nuclear deterrence theory” which leads to the use and threat of use of nuclear weapons. 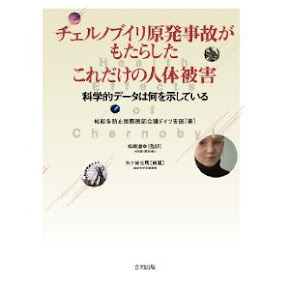 The book was co-authored by Peter Kuznick, 62, a history professor and director of the Nuclear Studies Institute at American University in Washington, DC and Akira Kimura, 56, a law professor at Kagoshima University. Professor Kuznick has brought groups of students to Hiroshima since 1995, the 50th anniversary of the atomic bombings, and to Nagasaki since 1998, for a peace studies tour. In this tour he has made efforts to dismiss the “A-bomb myth” through such activities as holding a workshop on the gap in perception between his students and students at Ritsumeikan University, Japanese participants in the tour, with regard to the atomic bombings and the A-bomb damage. After Professor Kimura joined the peace studies tour as a lecturer, the two professors became acquainted and the book project was conceived. 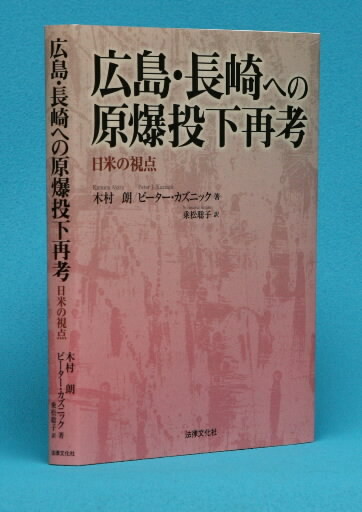 The book consists of three parts: Chapter I, Japan’s perception of the atomic bombings; Chapter II, the U.S. perception of the atomic bombings; and Chapter III, Discussion of the perceptions of the atomic bombings. The scholars both confirm the needlessness of the atomic bombings as well as how the myth came to be born, based on historical evidence from the standpoint of each nation. Professor Kuznick provides an example of the justification of the atomic bombing: President Truman first said that the atomic bombings saved the lives of several thousand U.S. soldiers, but later, with criticism mounting in response to the tremendous damage caused by the bombings, this number was inflated to 500,000, and then grew even greater. Professor Kimura puts particular focus on the atomic bombing of Nagasaki. 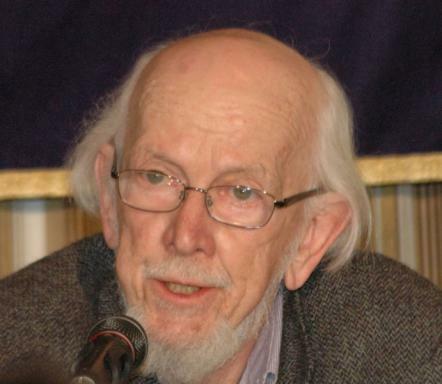 He suspects that the U.S. government saw the “Little Boy” bomb that was dropped on Hiroshima, a uranium-type bomb, and the “Fat Man” bomb that was dropped on Nagasaki, a plutonium-type bomb, as a single set from the start and used them mainly as an opportunity to conduct experiments on living people as well as gauge their physical power. Both scholars argue that it is vital to go beyond the conventional mindset of such thoughts as “the bombs brought a swift end to the war” and “they saved human lives,” while stressing the importance of detecting the illusory nature of the “A-bomb myth.” In their view, nuclear weapons are “inhumane weapons” which should not be used for any reason whatsoever, and a “crime against humanity.” From this perspective, they contend that the “nuclear deterrence theory,” including the issue of the U.S. nuclear umbrella that Japan has come to rely on, can finally be invalidated. In the book, Professor Kuznick has also assembled a report which traces the lives of Paul Tibbets, the pilot of the Enola Gay, the plane that dropped the atomic bomb on Hiroshima, and the members of his crew. As a whole, the book is compelling. The book, written in Japanese, has been issued by the publisher Horitsu Bunka Sha. 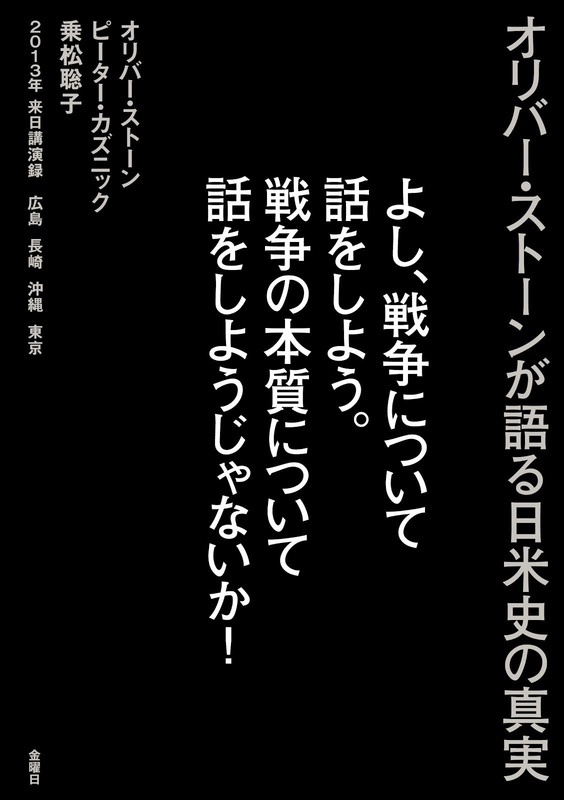 It is 216 pages in length and is priced at 2,940 yen. 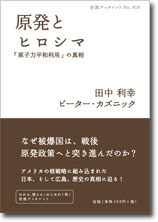 Professor Kuznick’s work was translated by Satoko Norimatsu. 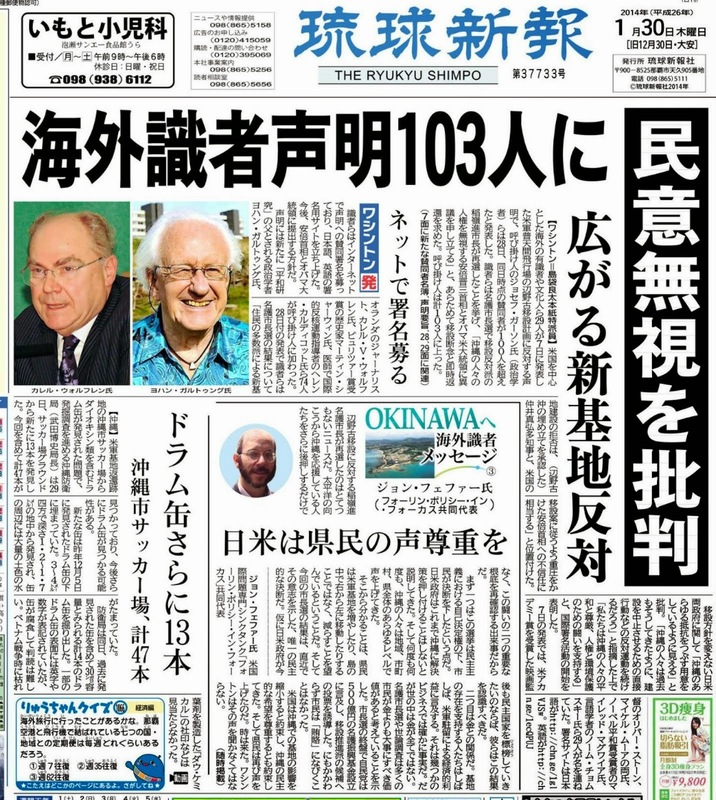 フォーラム『沖縄はどこへ向かうのか』 Forum: Where is Okinawa Going? 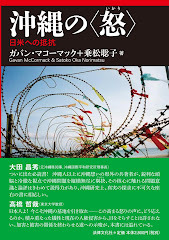 This is an introductory letter for the December 19 forum "Where is Okinawa Going?" at Okinawa University. See HERE for details. Photo from NHK - 400-500 people gathered around the Prefectural Hall to protest against Prime Minister Kan's visit to convince Okinawa to accept another US military base. The yesllow placards read, "Rescind." Okinawa residents are demanding the Japanese and US governments to rescind the agreement to build a new Marine Corps base in Henoko. See the Okinawa Times video of the protest at the Okinawa Prefectural Hall on the afternoon of December 17 by Okinawans who demand the US and Japanese governments to rescind their plan to build a new milibary base in Henoko. Yes, there are lots of angry cans that met Kan's visit. Japan's Prime Minister Naoto Kan and the governor of Okinawa Prefecture have failed to narrow their differences over the government's plan to relocate a US marine base within the southern island prefecture. Kan began his first visit to Okinawa as prime minister on Friday, and met Governor Hirokazu Nakaima in Naha City. Part of the meeting was opened to media. Japan and the United States agreed in May to relocate the US Marine Corps Futenma Air Station now in Ginowan, Okinawa, to Nago, also in Okinawa. Nakaima said relocating the base within Okinawa has become extremely difficult since Nago's January mayoral election, which was won by a candidate opposed to the relocation. Nakaima also spoke about his reelection in Okinawa's recent gubernatorial election, in which he promised voters that he would seek relocation outside Okinawa. He asked Kan to face up to reality and help realize the wishes of his prefecture's people. Kan noted that moving the facility outside Okinawa or even outside Japan was a 2009 election pledge by then Democratic Party leader Yukio Hatoyama and the party. Kan said that as prime minister and current leader of the party, he feels very sorry for its failure to honor the pledge. But he said a transfer to Henoko, in Nago, is a better option for Okinawa, if not the best, considering the current danger posed by the base and in terms of feasibility. He asked Nakaima to reconsider his stance, taking into account recent international developments. Kan also suggested that his government will positively consider requests by Okinawa for a new law to stimulate the prefecture's economy and for tax grants with no conditions attached to their usage. After the meeting, Kan told reporters that he plans to visit key areas for Okinawa's development and other areas related to US bases, so that he can fully grasp the local situation. Kan is scheduled to stay in the prefecture through Saturday. Prime Minister Naoto Kan visited Okinawa Prefecture Friday amid no signs of progress in easing tensions with local authorities over the relocation of a U.S. military base. Securing Okinawa’s acceptance of a plan to relocate the U.S. Marine Corps Futenma Air Station within the prefecture, agreed on earlier this year by Tokyo and Washington, is one of the many problems facing Kan, who is now struggling with low approval ratings for his six-month-old government. His itinerary for the two-day visit includes talks with Okinawa Gov Hirokazu Nakaima and a visit to the Futenma air base. The governor, who has opposed the relocation plan, was reelected for a four-year term in late November. Japan and the United States agreed in May to relocate the Futenma air base in a densely populated area of Ginowan to a less crowded part of the southwestern island. 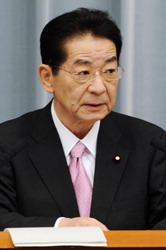 The deal has met with strong opposition because Kan’s predecessor, Yukio Hatoyama, had raised hopes that the base would be moved out of the prefecture. Kan has said the purpose of his visit is to learn about the real situation in the prefecture, which hosts the bulk of U.S. military forces stationed in Japan under a bilateral security accord. It will be Kan’s second visit to Okinawa since he became prime minister in June. The last time was to attend a ceremony to mark the 65th anniversary of the end of the Battle of Okinawa, in which over 200,000 soldiers and civilians died in the closing days of World War II. In November, Kan promised U.S. President Barack Obama during talks in Yokohama that Japan would keep to the bilateral agreement and that he would make the utmost efforts to relocate the base to a coastal area in Nago. However, Kan told reporters in early December that Japan will not put a deadline on settling the relocation issue, despite his plan to visit the United States next spring to release a joint statement with Obama on the two countries’ long-standing security alliance. Prime Miniter Kan Naoto will be in Okinawa on the afternoon of Decmeber 17. According to the NHK news report in the morning, Kan will arrive on the afternoon, meet with Okinawa's governor Nakaima Hirokazu, and discuss economic issues and the issue of "Futenma relocation." He is going to apologize for DPJ's failure to meet the pledge of former Prime Minister Hatoyama's call for removing the Futenma base out of the prefecture, and will try to convince Okinawa to accept the US-Japan agreement on May 28 to build a "replacement base" in Henoko. There is no plan for Kan to visit Nago or to meet with local citizens of Nago. There will be various protest activities, including the rally in front of the Prefectural Hall, and people are talking about bringing empty cans to make noises, punning on the word "can" and PM's name "Kan."
For Prime Minister Kan Naoto's visit to Okinawa on December 17 and 18, various protests are being planned in Okinawa to express opposition against the Henoko base plan and against the mainland's continuing discrimination to impose base burden on Okinawa. When Kan Naoto, formerly a civic activist became Prime Minister, I wondered whether he wanted to be remembered as a Prime Minister who bulldozed Okinawans to build a new base in Henoko. It is sad to see what Kan and Sengoku, formerly a student activist in 60's, have become once they are in power. Kan, in his first visit to Okinawa as a Prime Minister in June, thanked Okinawans for their base burden, and later on apologized for it, saying it was an inappropriate statement. Now he intends to go back there to "apologize where apology is due." One thing that is clear is that appreciation and apology only make sense when those are made with consideration of the recipients' feelings. In this case, any appreciation and apology only sends a message to Okinawans that there is no room for negotiation for the Henoko base plan and it will be built. I just cannot see Kan's visit to Okinawa this week will produce any positive result. It will, however, be an opportunity for Okinawans to reinforce their opposition against the new base, after the election. 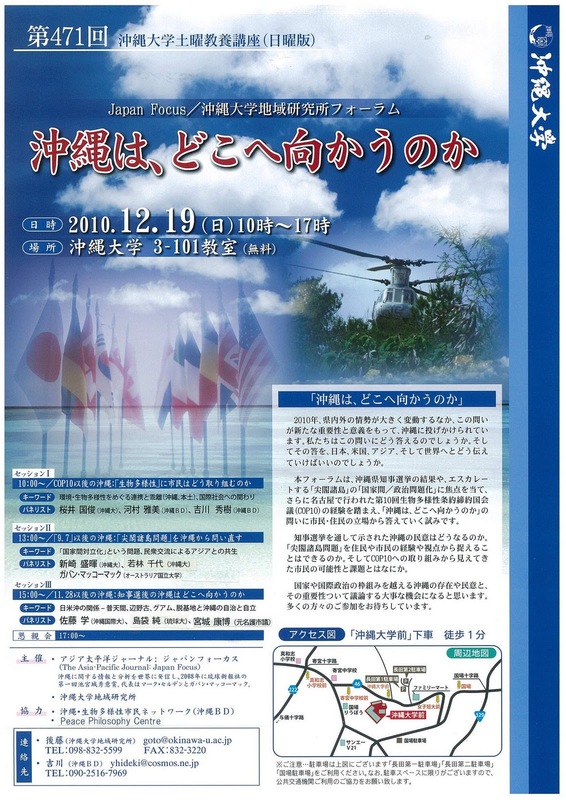 Prime Minister Kan Naoto is heading to Okinawa on December 17 and 18. Kan is reported as saying, "I will apologize properly to Okinawans where it's necessary to apologize," for the fact that DPJ could not deliver its promise to move the Futenma Air Station outside of the Prefecture. Chief Cabinet Secretary Sengoku on December 13 said to the press, "Our security concerns require deepening of Japan-US alliance and Japan-South Korea collaboration. From this perspective, we will have to ask Okinawans to accept this (base burden)." Sengoku also said, "We would like to faithfully implement the Japan-US agreement" to build a "replacement" base in Henoko. "As Yamatonchu (Japanese), we have imposed military bases on Okinawans," "but we cannot eliminate those bases in Okinawa overnight." Does Sengoku mean that since we cannot eliminate Okinawa bases overnight, we might as well add another base there? Prime Minister Naoto Kan will make a two-day visit to Okinawa Prefecture from Friday, Deputy Chief Cabinet Secretary Tetsuro Fukuyama said Monday, as the central government tries to make headway on the issue of relocating a U.S. Marine base. Fukuyama made the announcement to reporters while on a trip to Okinawa to lay the groundwork for Kan’s visit, which aims to discuss the relocation of the U.S. Marine Corps’ Futenma Air Station within the prefecture. Kan faces a challenge in securing local acceptance of the relocation plan, which was agreed in May by Tokyo and Washington, in light of the reelection late last month of Okinawa Gov Hirokazu Nakaima, who is opposed to the plan. Nakaima, during his meeting with Fukuyama and Kinya Takino, the other deputy chief cabinet secretary, appealed to the central government to drastically reduce the prefecture’s burden of hosting U.S. military bases. In Tokyo, Chief Cabinet Secretary Yoshito Sengoku said at a news conference that the government is making arrangements to convene in the coming weeks a council tasked with the future development of Okinawa Prefecture and alleviating the burden of hosting bases. In November, Kan promised U.S. President Barack Obama that he would make utmost efforts toward relocating the air station to a less crowded area in the prefecture. The Japanese leader is keen to make progress in discussions with the prefecture over the issue ahead of his visit to the United States next spring for talks with Obama. Okinawa has for decades hosted the bulk of U.S. military forces stationed in Japan under a bilateral security pact. Local residents have complained about accidents and crimes involving U.S. servicemen, as well as the pollution and safety risks associated with the military bases. The Japanese version of this article is to appear on Ryukyu Shimpo on December 14. As 2010 moves towards its end, it is impossible to refrain from thinking: how the world can change in a short span! A wave of militarism and chauvinism seems to be washing over East Asia, and the year ends with massive military exercises (war games) around the Korean peninsula and in the Sea of Japan. Watching these events, it is hard to remember the hope that filled the air just a few short years ago. It is just three years since North and South Korean leaders met and signed an agreement to cooperate and work out a path to peaceful unification of their divided peninsula, and specifically to turn the contested West Sea area into a zone of peace and cooperation; two years since Barack Obama came to office in the United States promising a better world, progress toward nuclear disarmament, an end to war, dialogue with all “enemies,” and just over one year since Hatoyama Yukio became Prime Minister of Japan, also promising change, offering the vision of an East Asian Community, equi-distant diplomacy with China and the United States, and meeting amicably with the leader of China to propose turning the South China Sea into a “Sea of Fraternité” (Yuai no umi). A new government in Korea in 2008 quickly swept aside the South-North Agreements, and new governments in the US and Japan in 2009 also turned away from the peaceful change they had promised. Obama continued, and intensified the two wars he inherited (while engaging in pressures and threats that suggested the possibility of a third and even a fourth, in Iran and North Korea), and continued with illegal detentions and assassinations; and Japan declared the US alliance its core, moving simultaneously towards participation in collective war-rehearsing exercises that are plainly unconstitutional, pressing for construction of a new base for the Marines in Henoko, and reinforcing the SDF military presence on the outlying islands. Three major events punctuated the year about to end. In March, the South Korean warship, the Cheonan, sank in waters of the West Sea, with loss of 46 sailors. A South Korea-led international investigation team blamed North Korea for a deliberate and unprovoked attack. The investigation report was later shown to be full of holes and contradictions, but the US and its allied governments and the international media endorsed it and dismissed North Korean protest. On 7 September, a Chinese fishing trawler collided with a Japanese Coastguard vessel in the contested waters off the Senkaku/Diaoyu Islands, and again the US-led global coalition (and its media), without hesitation or qualification, blamed China for belligerence. Yet, by arresting the ship’s captain the Government of Japan was unilaterally abrogating the 1978 agreement with China’s Deng Xiaoping to shelve the dispute for a future generation, and by insisting there was no question of Japan’s incontestable sovereignty, it was insulting both China and Taiwan who also claimed sovereignty. Then, on 23 November, a North Korean artillery barrage killed four people on South Korea’s Yeonpyeong Island and again South Korea, together with the US and Japan, blamed North Korea for “unprovoked aggression.” Yet this was the third day of huge South Korean war games (70,000 soldiers, 500 warplanes, 90 helicopters, 50 warships) conducted just a few kilometres off North Korean shores, in which they had fired over 3,000 rounds of artillery into surrounding, contested waters and ignored North Korean protests before North Korea retaliated. Shortly after the exchange of fire, the nuclear-powered aircraft carrier George Washington sailed into the Yellow Sea, to continue exercises that plainly were designed to step up the intimidation of North Korea, and provoke China as well by entering uninvited into the Yellow Sea. A week later, the US and Japan chose to commemorate the 50th anniversary of Ampo by the largest war games they had ever conducted (44,000 soldiers, 40 warplanes, 60 warships, with again the George Washington in pride of place), rehearsing anti-missile warfare and the ‘re-capture” of islands taken by an “enemy. The latter were plainly predicated on a Chinese attack on either Senkaku/Diaoyu or an outlying Okinawan island. As North Korea bashing and China intimidation escalated, North Korea’s overtures for negotiations in which it would trade its nuclear programs for guarantees of security and a peace treaty to end the 57-year long frozen standoff, were contemptuously dismissed. The US, Japan, and South Korea met the North Korean and Chinese call for negotiations with stepped-up military pressure. Hostility, fear, and hyper-nationalism (or what I call in the Japanese case zokkoku nationalism) spread. Military alliances were reconfirmed and reinforced, as on the eve of all recent wars. It is common for Japanese leaders to refer to the US as the stabilizer, the supplier of the oxygen of security, the bulwark of democracy and human rights, and to blame (in this region) China and North Korea for aggressive and destabilizing behaviour. Recent events in particular make clear that that is false and tendentious. 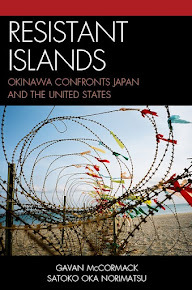 In this darkening climate of rising militarism and unreason, Okinawa constituted a tiny beacon of hope and resistance. 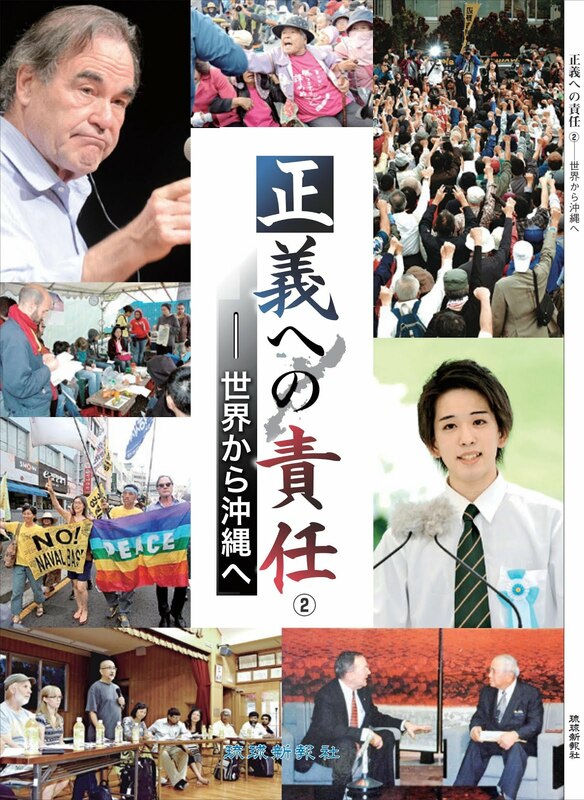 From the Nago City mayoral election of January to the prefectural Governor election of November, the Okinawan people intervened decisively to insist on the constitutional principles of the sovereignty of the people (shuken zai min) and the centrality of peace. 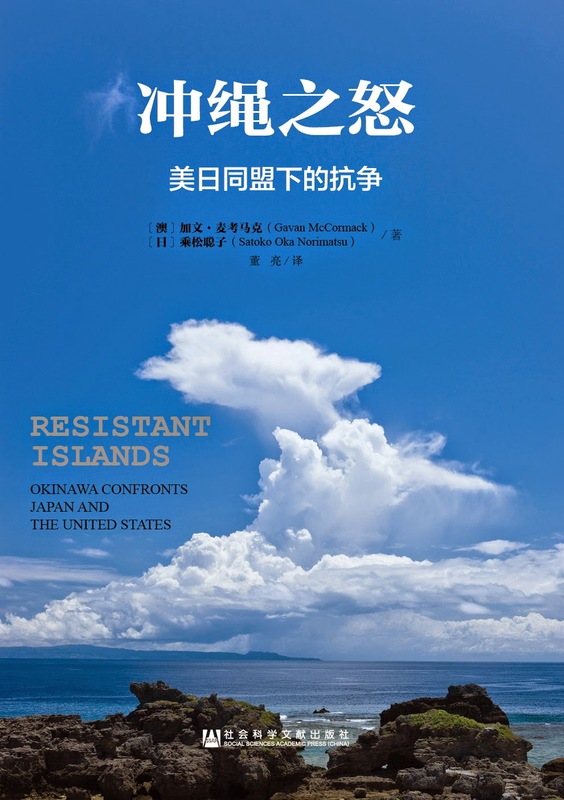 Okinawa showed the power of citizen-led democracy and commitment to constitutional principle, and in the gathering gloom of irrational chauvinism pointed towards a better future, predicated on overcoming its position as “Keystone of the Pacific” for US military planners. Either that Okinawan spirit spreads to Okinawa’s neighbours, or else Okinawa will find itself once again engulfed in militarism and the catastrophe of war. *** This forum will present and discuss Okinawan perspectives on the current situations surrounding the southernmost islands of Japan, amid the ongoing controversy over "Futenma relocation" issue, from three aspects: 1) environment and biodiversity, after the Convention of Biological Diversity (COP10) in Nagoya; 2) regional geopolitics in the wake of the Japan-China conflict over the ship collision near Senkaku/Diaoyu Islands ; 3) Okinawa-Japan-US relationship and the military base issue after the gubernatorial election. *** Conference organizers gratefully acknowledge the support received from the Australian Naitonal University. *** Free admission. The forum will be primarily run in the Japanese language. Translation from and to English can be provided during the Q and A. See below for English translation of the program, and the flyer. Session I (10 AM-): Okinawa, after COP10: citizens efforts to protect and promote "biodiversity"
Session III (3 PM-) Okinawa after November 28: Where is Okinawa going, after the gubernatorial election? Author Yoshida Kensei challenged the NHK program "Close-Up Gendai" on November 29. Sequel to the previous post, this is the rest of my dialogue with Doug. See previous post here, with explanation of terms like kokugai and kengai. If my memory of what I learned from you before is correct, you said something along the line of calling for unconditional closure of Futenma being equivalent of calling for disbanding of the Futenma USMC units, and that would be unrealistic and irresponsible, because one is not in the position to tell a foreign government what to do with their existing military unit. Please correct me if I am wrong. 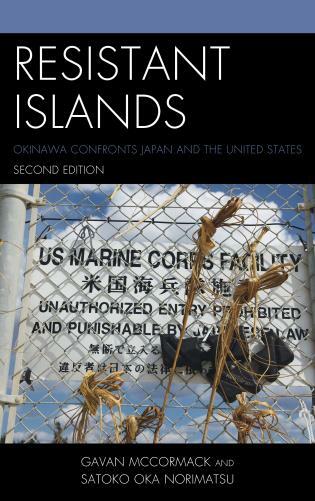 I think you implied by saying that calling for unconditional closure of Futenma would be asking something impossible, which would be irresponsible, because wanting something impossible would be equivalent of wanting nothing, and that would only perpetuate the status quo, which is unfair base burden of Okinawa: therefore it is colonial. 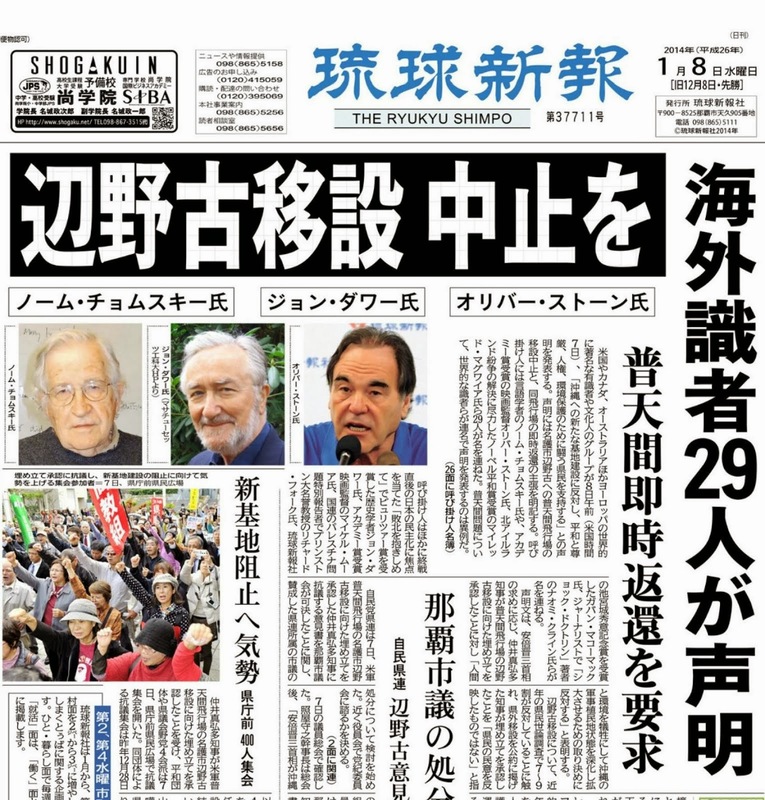 If my reading you is right, Japanese people are hypocritical if they support Okinawa's call for less bases but support ANPO (Japan-US Security Treaty) at the same time. They should accept base burden in their backyard as long as they support ANPO. But calling for abolishment of ANPO is problematic too, because it is not realistic in any foreseeable future. Again, just talking about something impossible would be the same as talking about nothing, which would be equivalent of approving status quo and that would be colonial. So, Nakaima's point of kengai, no matter how sincere or insincere his motivation might be, should be emphasized on and should be embraced by the mainland Japanese. Only then Japanese will seriously think about ANPO; they will think more in the same way as Okinawans. They the whole nation will be united to work together against ANPO itself. Is this what you envision? Going back to the election, what if Iha simply called for kokugai, without specifying the place. It would have been hard for Iha to do, knowing the US plan to move Marines there anyway, on which he has no control on whether he wants it or not. But if he did, would you have supported him more whole-heartedly? For you it would still have been better than his calling for unconditional closure, which would be colonial. Then I wonder why Iha didn't do that: just call for kokugai. What did he gain by talking about Guam, rather than kokugai? I don't have an answer for that. Touching on what you said about Nakaima reading the situation correctly - if electing a candidate who makes pledges only on reading majority trends in order to win an election is a way for democratic victory, aren't we encouraging any election candidates to read the trend of the time, and if that's the case, in theory all candidates (at least who are ready to win) will have no policy differences. Would that facilitate democracy? No. Citizens will just deprive themselves of their opportunity to voice their position through election, because they will have no choice, as all candidates will already have read the majority opinion. There will be absolutely no room for minority voices, and that would defeat the fundamental purpose of democracy. Do you see the contradiction? By supporting Nakaima's strategy and his victory, are you not voting against democracy itself? Is it not that only in this specific case, Nakaima's victory happened to work for the anti-colonial cause that you support, therefore you support his strategy retrospectively? Having said this, I agree with the last point you make about his Okinawa nationalism and his anger for Japanese and US governments for their "over-the-head" dealings and decisions. As an Okinawan, I don't think it is hard for him to think this way. But having heard how he justified his previous support for Henoko plan ("I only accepted because Nago said yes"), I can't help thinking in a matter of time he would move so that he would influence the very trend that he would want to read on and act on. I can't help thinking his immediate visit to Tokyo after the election is his first step toward that direction. Dialogue with you helped me think deeply. Having said all that, I think about the colonial issue you raised more than ever before. Thank you Doug. I think I see what you are saying about Nakaima and democracy. But it maybe depends on where you look for, to use an old Marxist term,l the agent of change. If you look for Nakaima himself to be the agent of change, of course, what could be more dubious? 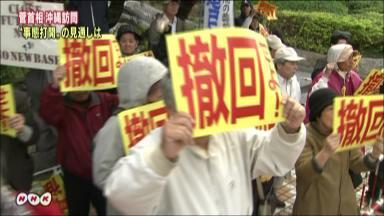 But I think at this moment the agent of change is the Okinawa electorate. They have changed themselves, they have changed the situation, and as a result they have forced a change in Nakaima - if not in his character, at least in his behavior. He is an effect, not a cause. If he fails in this his political camp will go down to defeat in the next election, and they know it. That's why I think it is not wrong to think of this as a democratic moment. I see. Nakaima as an effect not a cause makes sense to me. So now our challenge is how to sustain that democratic "moment," as power shifts from the electorate to Nakaima after the election. What we must prevent from happening is him bringing himself down in exchange of a base approval, just like Higa did, and just like Hatoyama did. Another concern is how do LDP and Komeito hold themselves compatible with the fact that they endorsed Nakaima? They won't possibly call for kengai together with Nakaima. They will pressure him to come closer to them, as they regain power in the parliament. These are pessimistic scenarios but we must have them in mind in order to prevent them. Asia-Pacific Journal: Japan Focus and Okinawa University will co-organize a forum with this theme on December 19, 2010 at Okinawa University. Information will be posted. Here is an exchange of emails between Douglas Lummis and me, as he responded to my previous post - comments on the Okinawa gubernatorial election. I wanted to share Doug's insights with a wider audience, and with his kind permission, I am posting below. (Doug's in green letters, and mine in blue. See Gavan McCormack' comment below too.) See HERE for Part II. (Some Japanese words that frequently appear in the discussion of Futenma "relocation" problem. Kennai isetsu, or kennai: literally meaning "moving within a prefecture," and in the context of this issue, it means building another base within Okinawa as replacement of MCAS Futenma. Kengai isetsu, or kengai: literally meaning "moving outside of prefecture," and in the context of this issue, it means building a new facility in a place other than Okinawa but within Japan, and/or using or upgrading existing facilities within Japan (but not in Okinawa) to transfer the functions of MCAS Futenma. Thanks for forwarding your piece on the Okinawa gubernatorial election. But I have to say that I think you are missing something very important. Or at the very least, that there are other ways of looking at the result. I think it’s wrong to say that the Okinawan voters have been deceived. Rather, I think they understood pretty clearly the choice they were making. The main significance of this election was that neither of the serious candidates supported the DPJ line, i.e. that the US Marine Air Station at Futenma should be moved to Henoko. The only party that supported that idea was the Kofuku Jitsugen To. They spent a huge amount of money on the election, and brought in an army of volunteers from mainland Japan. Their flags and posters and soundtrucks were everywhere. And they got 2% of the vote. And the voters also didn’t support Iha’s vagaries about Guam. By vagary I mean that he tried to avoid saying directly that he supported moving the base to Guam (saying that he was only revealing that the US had such a plan) while at the same time making clear that he saw this as a solution to the problem, and occasionally forgetting himself and saying that he did support it. Several years ago I heard him give a talk on the Guam option, after which someone asked from the floor, “What about the anti-base movement in Guam?” Iha’s answer was (I quote from memory) “That’s very small, negligible, nothing to worry about.” In the present election, a person in Iha’s camp who had been very active in opposing the Guam option and supporting solidarity with the Guam anti-base movement, was asked how she could campaign for Iha. She answered, “Oh, that’s a lie (uso). He doesn’t really favor it. He’s just saying that to win the election.” Another person working in the Iha camp told me that he thinks the woman was engaging in wishful thinking, to make it possible to work with Iha. That’s how vague it was: even people working in his campaign couldn’t agree on what Iha really meant. I think the Okinawa voters should be admired for voting against moving the base to an even more powerless colony. A Chamorro woman who came to Okinawa last June said at a rally, “Please understand that Guam is not America. Guam belongs to America.” She pointed out that Guamanians have no vote in U.S. national elections and so can be, and are, politically ignored. As for Nakaima’s changed position; yes, of course, it would be wrong to trust him; he has to be watched and pressured constantly. But remember the reason he changed was because his advisors (principally Naha Mayor Onaga it seems) told him that you can no longer win an election in Okinawa by saying you support, or will accept, moving the base to Henoko. So both candidates opposed Henoko plan, but they constructed their opposition differently. Iha said, I oppose the base; I as Governor will prevent its construction. Nakaima said (in effect), it doesn’t matter what I think. The people of Okinawa have made it impossible to build the base. It can’t be done. So which is the more democratic? The other big difference is that Iha said absolutely nothing about the option of moving the base to mainland Japan. There were several reasons for this. One would like to believe that as a pacifist, he could not in good conscience support the base being simply moved to another location, but would rather see it abolished altogether. But if so, he had no business pushing the Guam option. More importantly, he is very much dependent on the mainland anti-war movement for support, and doesn’t want to say anything to anger them. And talking about the mainland option does anger Japanese anti-war people immensely. Secondly, if he had taken that position the Japan Communist Party would not have supported him. As it was, the JCP also sent an army of volunteers from the mainland to work in his campaign. From Iha soundtrucks you could hear voices saying (in mainland accents) things like, “Okinawans! Please get rid of your bases!). This kind of preaching did not, I think, help his cause much. Nakaima took the position known here as kengai isetsu (県外移設) which literally means, move out of the prefecture, but is understood to mean, move to mainland Japan. That he won the election on this slogan marks a sea change in Okinawan opinion. It changes the terms of the debate. What had been a purely anti-war, anti-base discourse is now one in which anti-colonialism and anti-discrimination are also an isue. He said, these bases are not Okinawa’s responsibility, they are Yamato Japan’s responsibility. (He uses the Okinawan expression Yamatuu which expresses a mild level of anger or distain, comparable perhaps to an American Black’s use of the term honky). Until recently it was only a small minority who took this position, and received a lot of abuse for taking it. Nakaima, who owes nothing to the Japanese peace movement or to the JCP, has brought it into mainstream discourse, and won an election on it. Again, you can’t catch the significance of this only within a war-antiwar or left-right framework; you have to see it in a colonial-anticolonial framework. It may be that some people in Tokyo felt relief at Nakaima’s victory, but I think that only means they haven’t grasped the situation. Only 2% of the voters here supported the Tokyo government’s position, this despite all the fuss about fearsome Chinese fishing boats and North Korean artillery. 98% voted against it. And Nakaima, if he keeps his promise (and the pressure on him to do so will be huge) is going to dump the base issue right back onto Tokyo’s lap. I don’t know, but I wouldn’t be surprised to see another prime minister knocked out of office by this. I have been thinking about what you wrote. I wonder if people rejected the Happy party (Kofuku Jitsugen To: see John Feffer's assessment of this party in Foreign Policy in Focus) because of their politics or because they are simply crazy. I saw their disgusting propaganda video. I would not draw too much attention on the Happy by stressing the 98-2 ratio. I would not use it. I supported Iha because of his principle to oppose the Henoko plan. I agree to the idea of taking Nakaima's kengai pledge as hostage and use that to pressure him, but for me using the 98 number would mean to support Nakaima retrospectively, which I can't possibly pretend to do, just because he won more votes than Iha. If you began by supporting Nakaima, fine, and that's what you did maybe, but if not, I think it would be a wrong thing to do. One might say that saying 98% is not a retrospective support for Nakaima, but simply an observation of the result. But I would say no. I would not take advantage of whom I opposed in order to make my point. Do you support Nakaima because of his kengai choice? But is he sincere about this? As soon as he was elected, Nakaima said, before he only accepted the Henoko plan because Nago City said "yes." Nakaima should have known that Nago's "yes" was a result of dirty dealings behind the series of events in 1997/1998 (Nago's plebscite in which the majority said "no" to the base - mayor Higa's betrayal and resignation - then mayoral election in which pro-base Kishimoto won - gubernatorial election in which Ota was defeated by pro-base Inamine. See my second comment at the end of my election post at this link for details.) Applying that logic, if all the other prefectures say no to kengai, and if there is one vulnerable community somewhere in Okinawa that's made to say "yes" with a similar mechanism that brought Nago to say "yes" before, Nakaima will just jump on the opportunity. He has no principle. I can't even see any sign of his saying kengai from an anticolonial principle. To me, it sounds worlds apart when you say kengai and when he says it. One thing I haven't been able to figure about Iha is exactly what you said. He said he wasn't endorsing it; he was only revealing the Pentagon documents about it and was holding US and Japanese governments accountable for them. But he changed, especially during the election, he openly started to say Guam. I can guess different scenarios why he chose to do so, but it is meaningless to go into speculation at this point. One thing I was totally unaware of is JCP's pressure on Iha. Thank you for that information. What you have been saying and writing has brought awareness about the implication of kengai, and that would be the only thing about Nakaima that I would support, but again, I can't help thinking Nakaima's practical strategy only happened to fit in that anticolonial expectation. I am not saying he doesn't have that value in him; as an Okinawan of course he should. Thanks for your thoughtful note. I should make clear that, if I had the right to vote in Okinawa, I would have voted for Iha, not at all happily, with deep reservations, but he would have got my vote. This is partly because of Nakaima’s support for the SDF, and partly because I like the people around Iha a lot better. If he had gotten elected, I would have joined those among his supporters who were preparing, were he elected, to lobby him to shut up about Guam. (One reason he was defeated was that there were a lot of people on his team who were less than enthusiastic). I went with my family to his final rally on the Saturday night before the election, and we were among the many hundreds of people he shook hands with there. But I still think that the big significance of this election is that both of the serious candidates, from their different angles, opposed moving the base to Henoko. Of course you are right that the Happy Party, as you aptly call them, are a pack of crazies, and just about everybody knows that. But you can run that the other way: in this election the only people to support the government position was a pack of crazies. Yes, if the DPJ had fielded a candidate they would have got more than 2%, but they still would have suffered a humiliating loss, which is presumably why they didn’t run anybody. Around the time of the Hatoyama resignation, an opinion poll showed Okinawan support for the Japan-US Security Treaty at 6% (Compared to over 60% in mainland Japan) with support for the DJP just a few points more. On Iha and Guam, either he supported the option, which is I think a shameful position, or he didn’t but said he did in order to win the election, which is also not so admirable. In either case, I think Guam for him was a ploy to allow him to talk about getting rid of the Futenma base without either dealing in unpersuasive abstractions (the base should be banished from the world) or offending Japan (kengai isetsu). If he had won the election I think he would have had to stop talking about it, because the question of where the US should locate its bases outside Japanese territory is outside the Okinawa Governor’s, and the Japanese Government’s, jurisdiction. In the event, the ploy did not win him the election. And with his defeat, I suspect the Guam option will fade from public discourse here. On Nakaima, again, it’s not a question of liking or trusting him. You are right to point out that he has on his record support for the phoney “consent” that was bulldozed out of the city of Nago. (But remember Iha has on his record now virtual support for a similar process in Guam). But in this election, the great thing is that Nakaima read the situation correctly: you can’t win an election here by saying you will accept a base at Henoko. Depending on how you look at it, you could say he is just an opportunist, or you could say it is a victory for democracy. You could say he is deceiving the voters, or you could say that the voters have forced him to change his position. The important thing not to sit back and see which of these turns out to be true, but to make sure that the latter proves true. That is, by no means to relax and leave it up to him, but to watch him like a hawk, and to jack up the pressure. At the same time I am increasingly getting the impression that he may be serious in his nationalism, and in his anger (in some situations, anger is the healthy response) toward Japan. There’s no necessary contradiction between being a conservative and being a nationalist. The old curmudgeon is saying some pretty tough and interesting things these days. With regard to the unequal distribution of the bases, he is able to use the word “discrimination”, a word that doesn’t seem to be included in Iha’s vocabulary. I am wondering whether it may sometimes happen that a politician takes a position opportunistically, and after repeating it over and over on many occasions, comes to discover that he believes it. Please see the next post for the rest of the conversation. Link HERE. 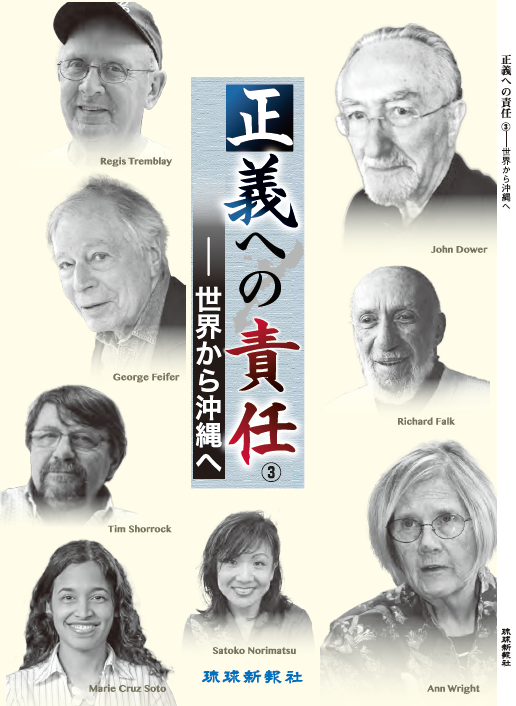 C. Douglas Lummis, a former US Marine stationed on Okinawa, is the author of Radical Democracy and other books in Japanese and English. A Japan Focus associate, he formerly taught at Tsuda College. See this LINK for a list of Doug's articles on Asia-Pacific Journal: Japan Focus.